Over the last couple of decades, this environmentally sensitive mindset, combined with innovations in engineering and design, has had a noticeable impact on trends in construction and architecture. Today’s builders are creating beautiful, sustainable structures — examples of which include green bridges that combine energy efficiency, low-impact construction, and stunning design. Notable bridges for automobiles, pedestrians, and even wildlife have begun to pop up around the globe, and more inspiring designs are in the works. Australia is a very sunny country, so it makes sense to harness and utilize all of that sunlight. Even better: to do so using a functional piece of architecture that people can enjoy every day. 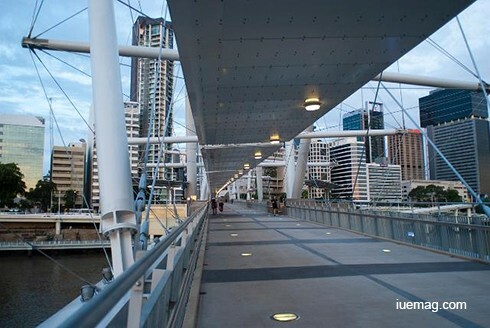 Kurilpa Bridge, one of the world’s longest footbridges, opened in the central business district Australian city of Brisbane at the end of the last decade. What makes this bridge unique is that it’s also the world’s largest solar-powered footbridge. Spanning the Brisbane River, it provides a canopied, all-weather path for about 36,500 people each week. The bridge has a knitting needle-shaped design mounted with 84 solar panels that can fully power a sophisticated LED lighting system. It hosts festivals and other special occasions along the river. The efficient system is programmable to produce a variety of effects. The bridge provides a yearly output of 38MWh, putting excess power generated back into the city’s electrical grid when not in use for lighting. At its construction, it was projected to reduce carbon emissions by about 37.8 tons each year. Portland, Oregon is a city known for its progressive culture. So, it’s no surprise that Portland is also home to some truly progressive bridge design. The Morrison Bridge was built to cross the Willamette River nearly 60 years ago. Recently, the bridge deck got a modern update — its open steel grating was replaced with a fiber-reinforced polymer (FRP). A major gateway into the city, the Morrison Bridge’s outdated steel deck required regular, expensive maintenance due to the cold, wet climate of the Northwest and corrosion from salt and weather. The updated FRP deck is just as strong, provides higher friction than steel, and is a green technology. Unlike steel grating, which lets water pass through after picking up grease and oil from the bridge deck, the FRP surface collects rainwater for cleaning and treatment before releasing it back into the river. Other major bridges in Portland also use the FRP material, keeping the city’s multiple rivers cleaner for future generations. One inspiring example of green bridge building has actually been replicated thousands of times all over the world: wildlife crossings! These structures exist to prevent roadkill deaths and animal-related car accidents, keeping both wildlife and human lives safe. They usually span busy highways and are noticeable by their greenery, which helps to blend in with the natural environment. The idea originated in France, and variations on the theme have popped up all over Europe, in the US and Canada by inspired architects. They have served to protect and reestablish wildlife commonly killed in vehicle collisions, including — but not limited to — deer, badgers, moose, bears, wolves, elk, mountain goats, bighorn sheep, Florida panthers and smaller animals such as amphibians and tortoises. Thanks to these bridges, wildlife populations in the areas in which they exist have remained balanced. Human and animal traffic can coexist peacefully! A Bridge That Could Power Homes? Our technology has come a long way — but there’s still progress to be made! One concept dreamed up by a team of Italian designers won second place in a competition to imagine a bridge that would span Bagnara and Scilla, two regions in Italy. The bridge design, entitled Solar Wind, includes wind turbines, trees, and even greenhouses. Spanning 12.4 miles, it would generate 40 million kWh of electricity per year — enough to power 15,000 homes! The greenhouses would not only allow growers to produce food but also sell it to passing drivers as well. The roadway itself would consist not of asphalt, but of a “solar roadway” made up of specialized solar panels. These designs could really change the game in green bridge design, and we can only hope that it inspires other similar designs as green construction and engineering continue to advance! Which style bridge would you like to see in your town? Comment below!